Tirol is really the place to be. With its amazing nature, culture and delicious food it’s become one of my favourite place in the world. There is nothing better to eat Kasspressknödel or Kaiserschmarrn after half a day of hiking. Especially the food that you can order in an alpine pasture is amazing! I really rather hike in Austrian than in the German Alps. They just have such great dishes. Each year we are going on holiday to the Alps and each time we try to eat something new. After these years we came with the list of the dishes that you should consider trying while being in Tirol. Just choose what you like and go for it! You won’t regret it! Kasspressknödel is the first Austrian speciality on our list. Those little flat dumplings are made of bread and Bergkäse which is an alp cheese. The Kasspressknödel can be served in soup, with a salad or Sauer kraut. They make a perfect starter or main course. Speckknödel – similar to Kasspressknödel are dumplings made of bread. Those once contain cubes of bacon instead of cheese. The dumplings can be boiled in salty water or baked in the oven. 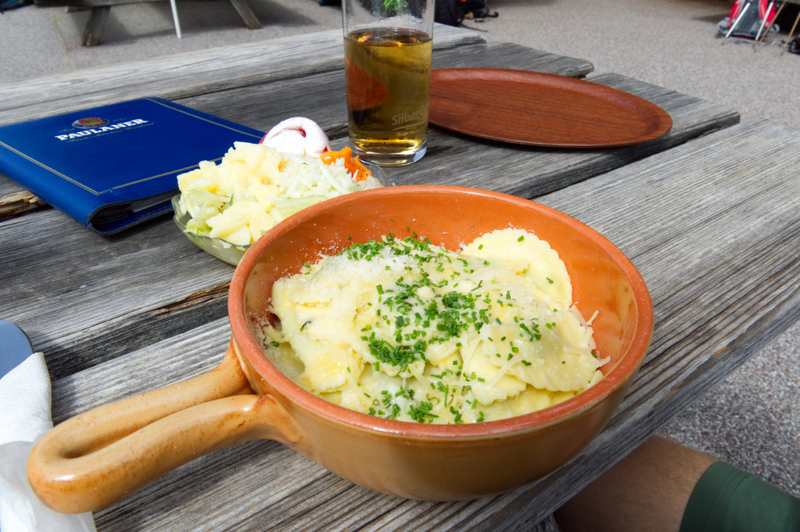 Speckknödel can be served in many different ways: as a side dish, main course or in the soup. I have eaten them with Sauerkraut, and this is how I would recommend trying them! If you would like to prepare this dish on your own, please see this recipe: Traditional Austrian Speckknödel. Spinatknödel main ingredients are bread and spinach. The best Spinatknödel we have eaten were Spinatknödel with butter and parmesan. Just look at them! They were soft, well seasoned and delicious! I think those are my favourite Knödel that I have ever had so far. If you would like to prepare this dish on your own, please see this recipe: Traditional Austrian Spinatknödel. Those little dumplings are very similar to ravioli or pierogi. Typical fillings include spinach, mushrooms, ricotta, quark or mozzarella. We have eaten Schlutzkrapfen in two different places in the Austrian Alps, and both of them served them with spinach filling, melted butter and parmesan on the top. You certainly cannot miss them while being in the Alps! This is traditional Austrian one plate dish which contains cooked potatoes, beef or pork slices, chopped onion and lots of clarified butter. The Tirol-Version is also served with fried egg on the top. The dish initially was served on Mondays and made from the rest of the Sunday roast. Those small and delicious dumplings are filled with apricots and served with fried breadcrumbs and powdered sugar. The dough is usually made of quark and potatoes. The dumplings are not only well known in Austria but also in the Czech Republic. Kaiserschmarrn becomes one of my favourite Austrian dishes. This massive plate with beautifully prepared dough with raisins, applesauce and vanilla ice cream, tastes special. From the outside, the mixture is crispy and sweet, from the inside soft and just mouthwatering! Some restaurants serve the dish without the raisins, having in mind that not everybody likes them, so if you like raisins make sure you say that while ordering it. Raisins give this dish particular taste as they are typically soaked in rum overnight. This is seriously heaven on earth! If you cannot wait to go to Austria and try them there you can try this recipe: Kaiserschmarrn like Austrians do! I hope you will enjoy your trip to Austra and will manage to try all those beautiful dishes, which are waiting there for you!